You can participate in a class that introduces and reviews the French vocabulary for body-related words and verbs of movement with a relaxing yoga experience to wind you down at the end of the class. 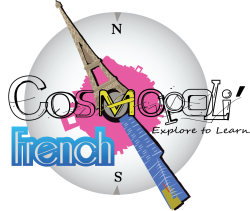 Relating to everyday stresses in your life, Cosmopoli'French brings a new way of learning to help send stress away. The class will be composed of a 30 minute French class where you will learn (or revise) some key vocabulary. After this introduction, Alexandra Faive your French yoga instructor will help you stretch your body and quiet your mind.